C-ludik > Africa > Namibia > Lake Otjikoto, a lake that digs its own hole! Lake Otjikoto, a lake that digs its own hole! How did lake Otjikoto develop? Only 110 yards from the main road, Route B1, to Etosha National Park, there is an expanse of turquoise water well hidden from sight behind gigantic fig trees and euphorbia. Lake Otjikoto, located in Namibia’s Oshikoto region about 12 miles north-west of the city of Tsumeb, is a circular sinkhole. It is 335 feet long and 405 feet wide and of indeterminate depth. It looks like a deep circular hole surrounded by steep, 65-foot dolomite walls created over 700 million years ago. Is this hole the result of a new “2012” scenario, a meteorite or simply the crater of an old volcano? Without a doubt, dear readers, Lake Otjikoto is simply a flooded doline or sinkhole. Ow, ow, I sense that you are starting to nod your head… And yet, behind this somewhat enigmatic name lies a simple and most impressive natural phenomenon: the sudden collapse of a karst cave roof creating a natural depression in the surface above! 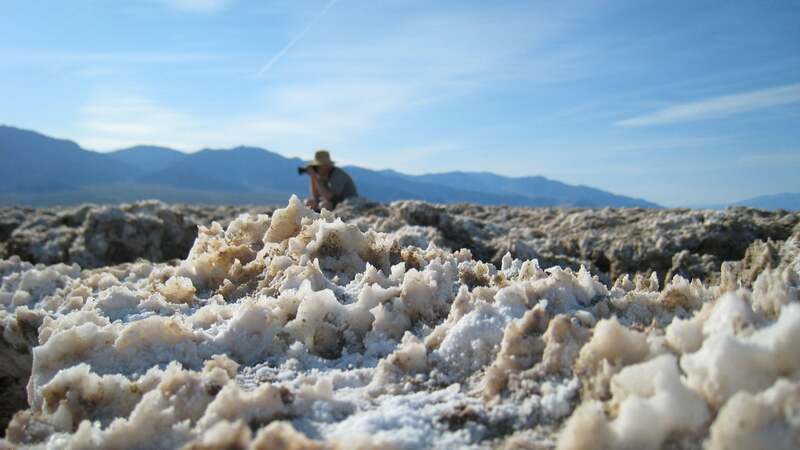 Anyone would call it a “big hole,” but geologists prefer the term “doline”. A “doline,” also known as a cenote or sinkhole, is more or less a circular or egg-shaped depression. If the depression is less regular in shape and larger in size, it is called a “polje”. These are natural phenomena that occur underground in karst environments, i.e. an environment where water (e. g. rainwater), rather than flowing on the surface, infiltrates the subsoil and erodes limestone rocks deep below. Over time, when the weight of the soil is too heavy, everything falls apart: a depression forms and the soil gives way to a huge hole! In the case of Lake Otjikoto, the doline was probably formed by the collapse of an underlying karst cavity. The water results from the fact that the bottom of the “doline” is lower than the local groundwater table. Below the surface is a real Emmental of rock (as everyone knows, Gruyère cheese doesn’t have holes): the subsoil of this region contains a vast underground network of galleries and caves forming a gigantic water reservoir… As a result, even though we estimate that the average depth of the lake as about 148 feet, its real depth remains a mystery to this day… quite simply because no one has ever reached the bottom. 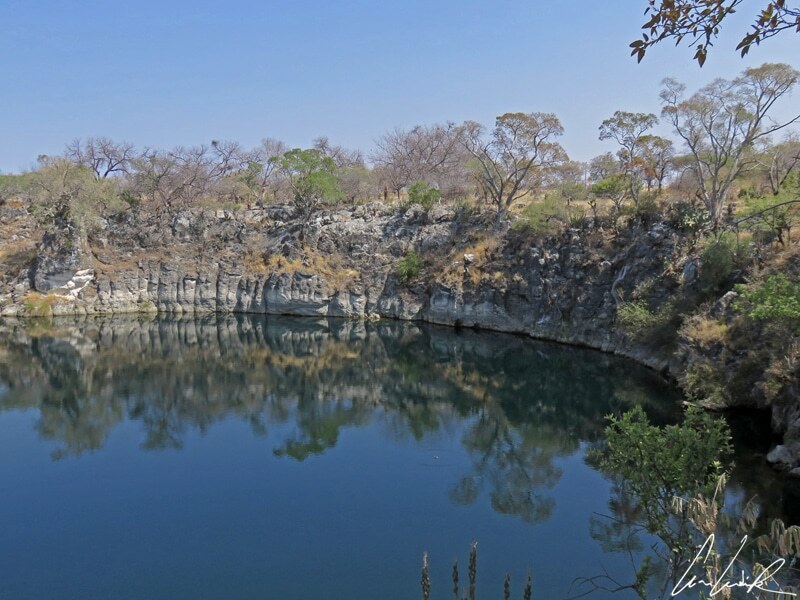 In the Herero language, Otjikoto means “deep hole”, and according to legend this lake is “bottomless”. High water pressure can potentially harm divers’ ears, but the bravest have still reached a depth of 476 feet without reaching the bottom! If, on the contrary, he had hit the bottom, would he have had in mind this quote from Marguerite Duras? « After a day and a half travel we suddenly found ourselves on the brink of Otjikoto, the most extraordinary chasm it was ever my fortune to see. It is scooped, so to say, out of the solid limestone rock, and, though on a thousand times larger scale, not unlike the Elv-gryta one so commonly meets in Scandinavia. The form of Otjikoto is cylindrical; its diameter upward of four hundred feet, and its depth, as we ascertained by the lead-line, two hundred and fifteen—that is, at the sides, for we had no means of plumbing the middle, but had reason to believe the depth to be pretty uniform throughout ». During the First World War (1914-1918), the Germans extracted copper from the Tsumeb mine. The copper was sent to Germany to be used in the manufacture of war supplies. Since mining is a water-intensive activity, a steam pump was installed to draw water from the lake. Even today, we can still see metal pipes connecting the lake to the Tsumeb mine. The most significant episode in the history of the lake took place on July 9, 1915. The Schutztruppe, German colonial troops, dumped a considerable amount of weaponry and supplies into the deep water of the lake (guns, rifles, ammunition) before surrendering to the British and South African troops, who had now taken charge of the country. Since then, after many successful dives, most of the materials have been recovered from Lake Otjikoto, guns, machine guns, military equipment, and a large quantity of ammunition… Even a perfectly preserved train car was brought to the surface! Most of these recovered and restored objects are on display at the Tsumeb Museum. However, still more war materials lie at the bottom of the lake with no prospect of ever being brought to the surface. According to legend the Germans also dumped a sealed safe containing six million gold marks into the lake. To this day, the search has been unsuccessful, and no one has found this sunken treasure! «Otjikoto, one of the most wonderful of nature’s freaks, is situated in the midst of a dense coppice. So effectually is it hidden from view that a person might pass within fifty paces of it without being aware of its existence». As we stroll around Lake Otjikoto, the drought confers a golden hue on to the vegetation and tufts of herbs that dance in the light wind. In this Savannah landscape, perennials grow in thick tufts scattered between bare soil and shrubs on which charming Birds. The acacia tree, so often featured in stunning photographs of African landscape, grows around the lake. Big thorns protect them against starving herbivores. The Savannah feeds more than 40 species of mammals. As a result, acacias have developed effective defenses that allow them to survive in this hostile environment: the thorns of the acacia Vachellia erioloba deter herbivores to graze, and the trees develop chemical compounds that give the leaves a bad taste and render them indigestible. 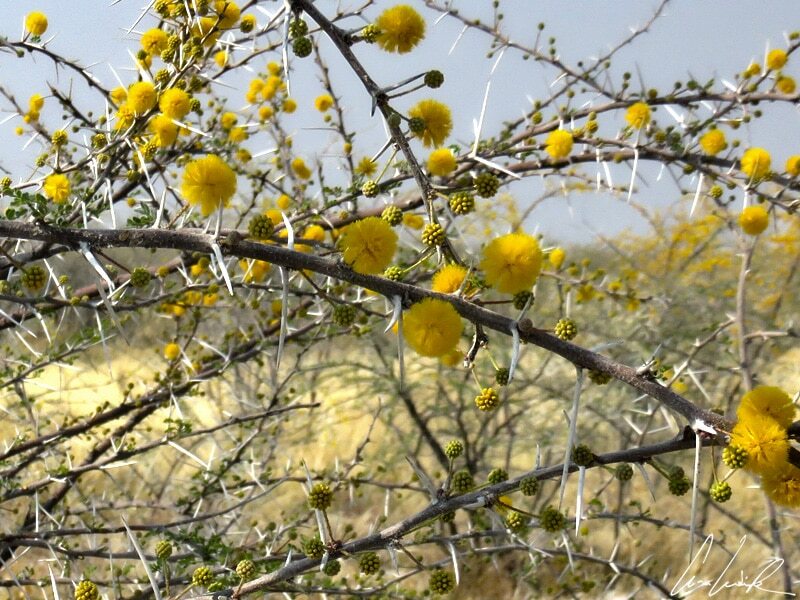 If the acacia is a master of self-defense… Is it also a keen reader of Sun Tzu’s “art of war”? 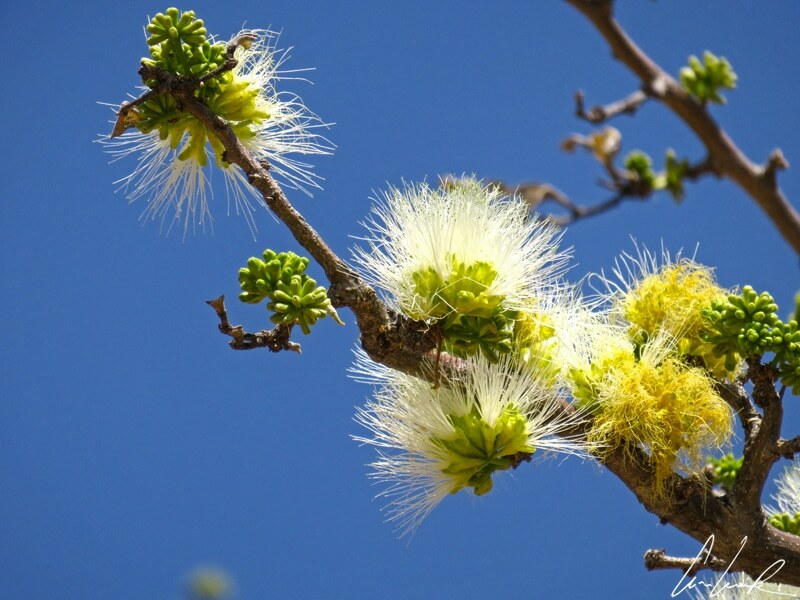 Now that we have discovered the murder weapon, the motive of these killer acacias and the scientific explanation, let’s go back to our botanical trail around Lake Otjikoto, where we may or may not encounter more friendly plants…! At the curve of the road stands a specimen of Aloe littoralis that proudly displays a sturdy trunk lined with dried leaves between 2 and 3 feet long. Described by British botanist John Gilbert Baker in 1878, Aloe littoralis is more commonly known as “Aloe Windhoek.” It serves as the emblem of the Namibian capital, Windhoek. The aloe appears on all municipal vehicles and on the city’s stationary. The rosette of leaves at the top of the unbranched trunk form a dense greyish-green crown. Be careful. These leaves are armed with brown teeth along the edges. A large inflorescence that consists of a sprout with eight to ten branches that grows out of the center of the rosette of leaves may reach 5 feet in height. Many branches extend up from the sprout with red or pale red flowers. The flowers and leaves are sometimes harvested and used as an ingredient in local food. However, the plant is mainly well known for its medicinal properties. The sap from the leaves contains anthraquinone components known for their laxative effects in the treatment of gastrointestinal disorders… In the same area, there are also many Aloe zebrina whose name can be easily understood by observing the zebra-like stripes on its leaves. 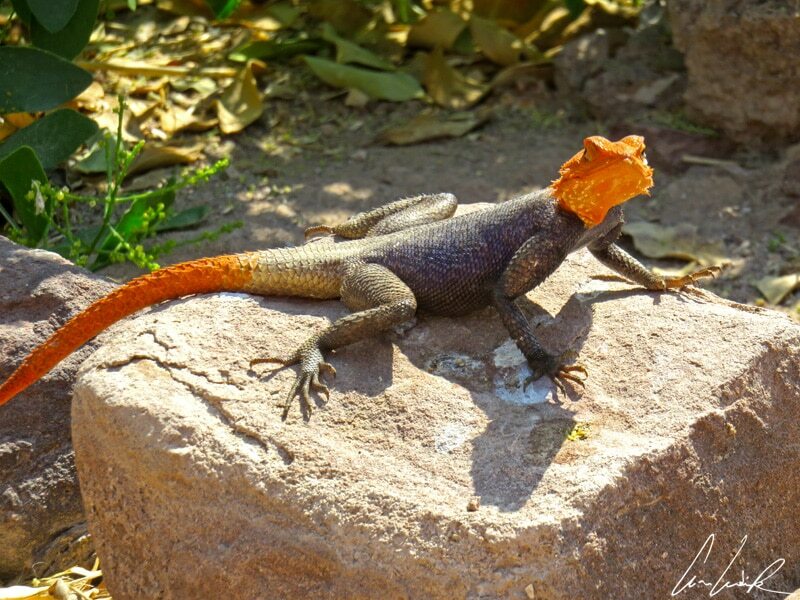 Next to this must to have plant for your rock garden, a rock agama (Agama planiceps) basking in the sun. This sizeable male lizard has a beautiful blue body with an orange head and tail. Nature does things well: there is no lack of good taste in the selection of these two complementary colors…. Our second encounter is with a succulent cactus-like plant called Euphorbia venenata. Um, um, with all these little black needles on either side of the stem this euphorbia doesn’t look very succulent, does it? The first expression that comes to mind would be “He who touches it gets pricked.” It is all a matter of definition: a succulent plant, also called a malacophyte, is a fleshy drought and heat tolerant plant adapted to survive in arid environments. No comparison possible with a succulent potjiekos preparation (pronounced “poi-key-kos” and translated as “small-pot food”). The potjiekos is a slow-cooking dish, traditionally cooked outdoor in a three-legged cast-iron casserole! If this Euphorbia looks so much like a cactus, it is due to a convergence phenomenon. Indeed, facing similar arid environments, euphorbia, commonly named “spurge,” looks like cactus because in the course of their evolution both euphorbia and cacti developed convergent survival techniques to protect themselves from the lack of water. At the top of the stems are sparkling little yellow flowers. The female flowers are in the center and surrounded by a ring of male flowers. These flowers turn into small red fruits at the end of summer… The entire Euphorbiaceae family is undoubtedly one of the most toxic plants in the world. The milky, latex-like sap is poisonous and can cause skin irritations, among other things. This sap has long been used as a poison by some populations who coated their arrows with it for hunting. The name Euphorbia derives from Euphorbos, the Greek physician of Juba II of Mauritania, who ruled a little over 2000 years ago. Euphorbos discovered the medicinal properties specific to the sap of these plants, especially emetic and purgative… hence the common name of the plant: “Spurge” deriving from the Middle English/Old French espurge (to purge). 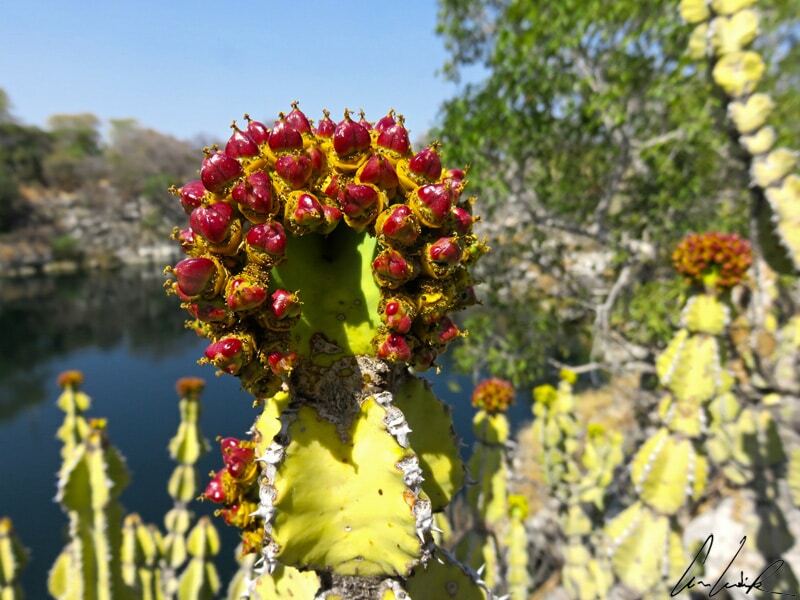 Finally, our botanical tour of Lake Otjikoto would be incomplete without mentioning the “python tree” or Fockea multiflora named after the Dutch botanist Charles Focke. This large succulent climbing plant grows up to 50 feet in length and can be 2 feet in diameter, twining on trees or any available support. Like a snake, the python vine gradually suffocates its victim before taking over entirely. Again, its sap is toxic and serves as poison for hunting arrows. 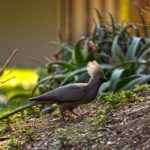 The Turacos concolor or Grey go-away-bird, also known as Grey lourie, is dressed in a smoky-grey plumage and has a magnificent slightly shaggy back-swept crest about 2 inches high. 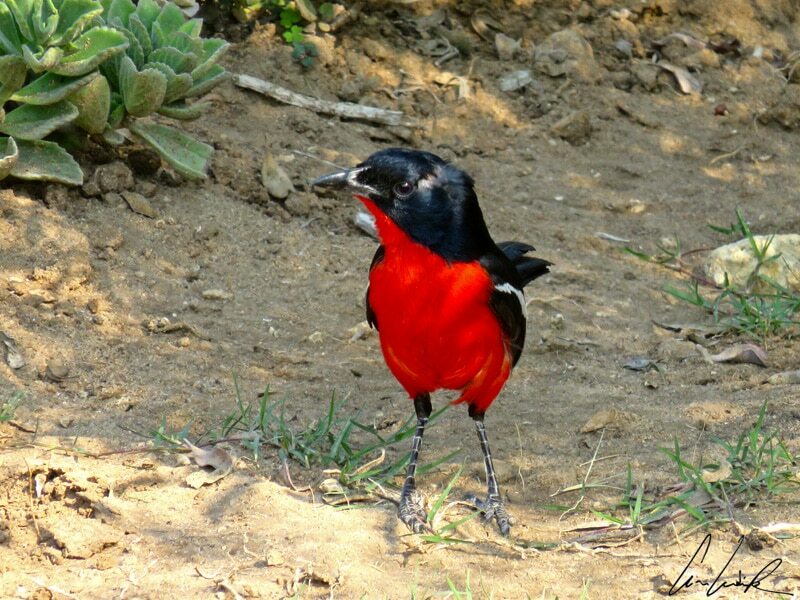 Perching in the branches of an acacia tree, is he unaware of the surrounding danger? Or maybe he and the acacia are just old friends? 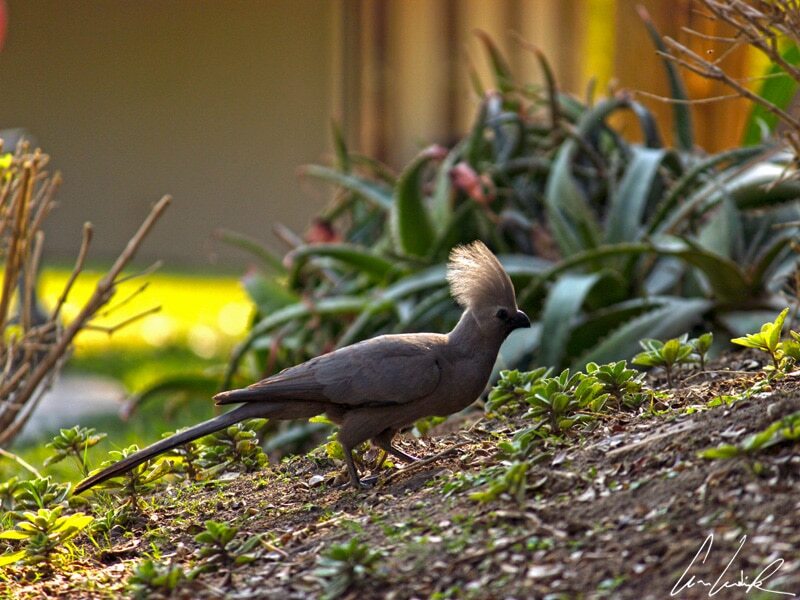 The Turacos concolor is identified by its piercing, nasty and noisy calls, “g’wa-ay, g’wa-ay”. Hence, its English name “Grey Go-Away Bird”. Listening to these series of plaintive notes, one might think it is preparing a new adventure of the “Angry Birds…” created by Finnish Rovio Entertainment. 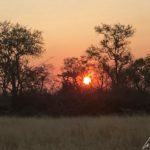 It is time for us to walk the last mile from Lake Otjikoto to the entrance of Etosha National Park with its abundant wildlife. Before even entering the sacrosanct animal parks, you have to look around to start your mini-safari. 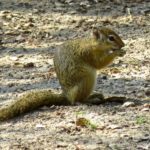 On our path, we run into Scrat and its acorn followed by a leopard carrying his house on his back… Ha, haha, you are suspicious, and you are right to be. 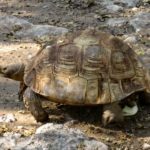 Stigmochelys pardalis or leopard tortoise is the second largest turtle in Africa and the fourth largest species of tortoise in the world. 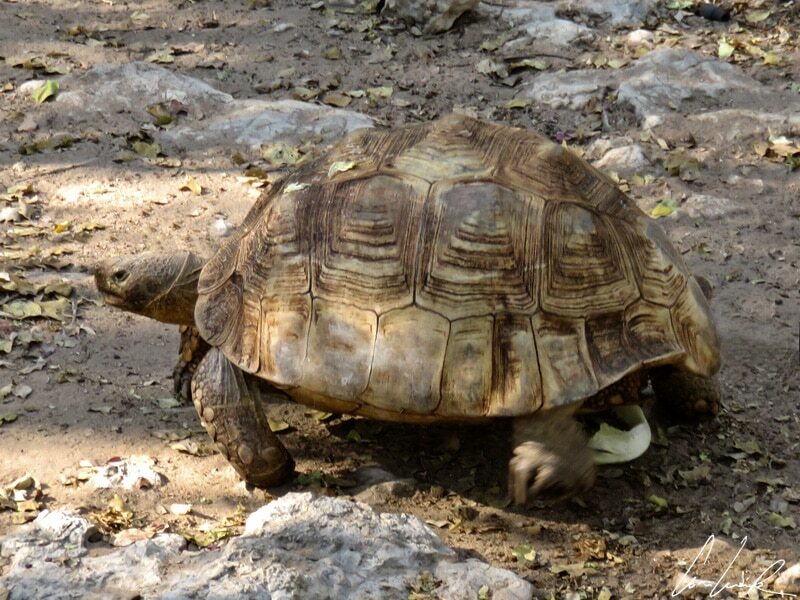 The adult reaches about 16 inches in length and weighs up to 29 pounds. However, some specimens may reach up to 20 inches and weigh 88 pounds. It is easily recognizable by its yellow carapace attractively decorated with black motifs and even stripes. This ornamentation tends to fade in mature adults to a nondescript brown or grey. 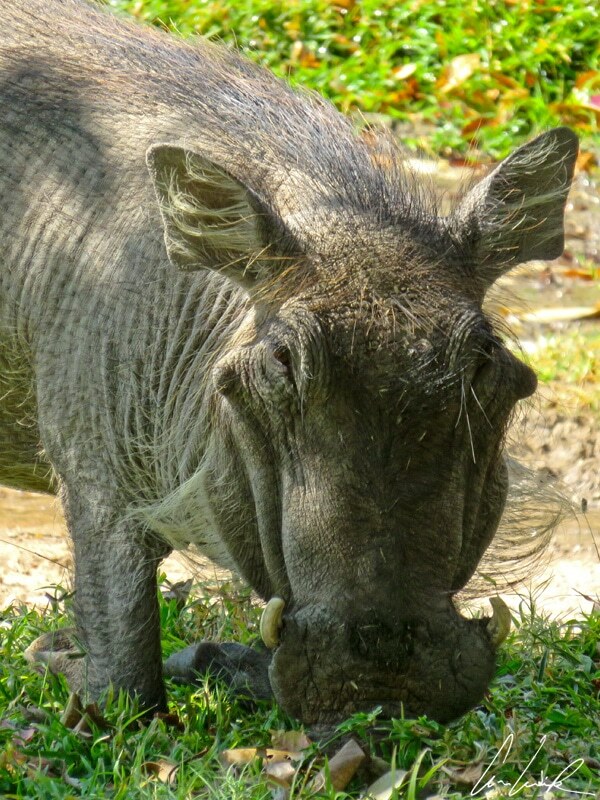 Of course, there is the inevitable warthog (Phacochoerus africanus). This animal has a strange appearance. It is without hair except for a tuft on its head a little like Titeuf? Brown in color with several large growths on its face, it has small ears and eyes placed very high on each side of its head. It is definitely not in the top 5 of the animal beauty contest (if I remember correctly, it has a good place in the five ugliest). However, behind this somewhat repulsive aspect, especially just after bathing in the mud (I know, I know there is also the inner beauty…) this animal has innate comic talents. 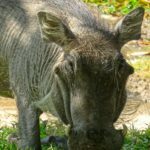 Remember that when he feels in danger, the warthog starts running with his tail up like an antenna to warn its companions… we could mistake it for a big remote-controlled pig! 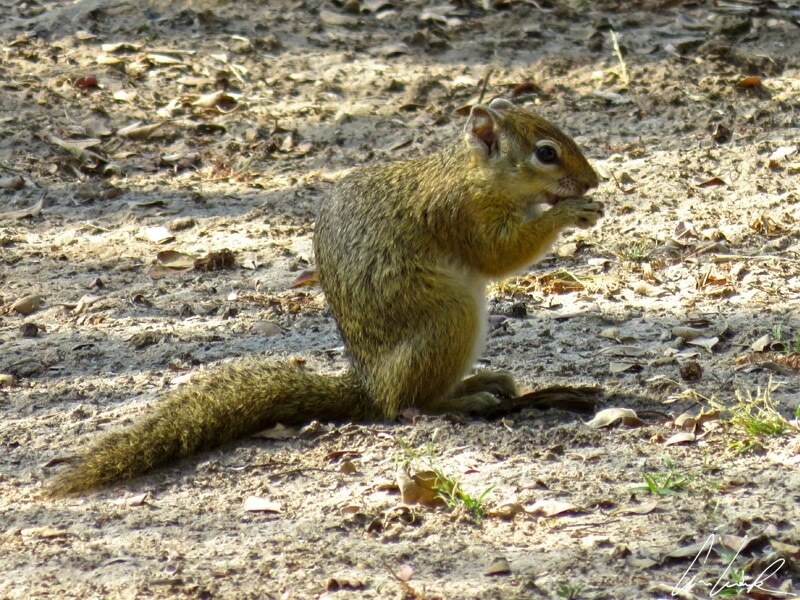 It also has the nickname of “Savannah mower” because while feeding the warthog kneels on its back legs. Thus, he can see what is happening in his surroundings… although his sight is very limited. Fortunately, its hearing and sense of smell are very developed. Let’s test your animal culture, faithful readers: the male is called a boar, and the babies are piglets* what is the name of the female? 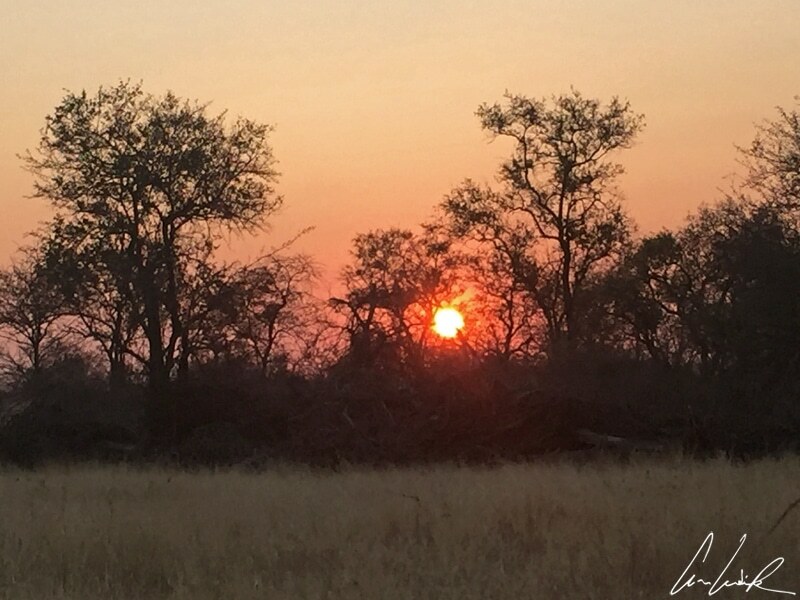 Our mini-safari comes to an end with a beautiful African sunset over the savannah. As the sun declines on the horizon, the land takes on a bright orange hue while the sky catches fire. 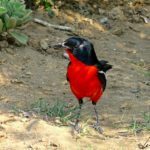 The silhouettes of trees and birds stand out in the foreground like Chinese shadows… a show that shut us down even our very vocal red and black gonolek! *the male is called a boar and the baby piglets* the female is called a sow? If you like this post, feel free to share it on Pinterest ! What prompt us to leave a comfy home behind and travel, if not the stories or the images that tell the tale of an elsewhere we, too, would like to discover ? Have you noticed how some books, movies or even songs fill you with the urge to pack and join the characters, sceneries and moods they conjure up ? It is more or less conscious, sometimes a guilty pleasure but the choice of a destination is often whispered by a novel’s hero, a movie’s shot or a guitar tune… Before taking you to the 4 corners of the world, here is a quote from a famous, albeit fictionnal, traveller: "it is a dangerous business, going out of your door ; you step onto the road and if you don’t keep your feet, there is no telling where you might be swept off to".